The vestibulo-cochlea complex of the mammalian inner ear consists of the perilymphatic labyrinth that contains the high sodium (Na+) low potassium (K+) fluid, perilymph. The perilymphatic system surrounds the contiguous, but sealed endolymphatic membranous labyrinth containing the high K+, low Na+ fluid, endolymph. The cochlea is divided into three chambers, the scala tympani, scala vestibuli, and the scala media, which contains the auditory receptor cells. The scala tympani and scala vestibuli are part of the perilymphatic system. The scala media contains endolymph that bathes the inner ear receptors. The outer hair cell receptors are also bathed by cortilymph, which is similar in composition to perilymph, in the inner tunnel region or Nuel space within the scala media. The endolymphatic and perilymphatic spaces are separated by a tight blood-labyrinth barrier that is similar in aspects to the blood-brain barrier. The delivery of drugs to treat inner ear disorders such as Meniere’s disease involves both intratympanic and intravenous introduction of substances that may reach the perilymphatic and endolymphatic spaces. 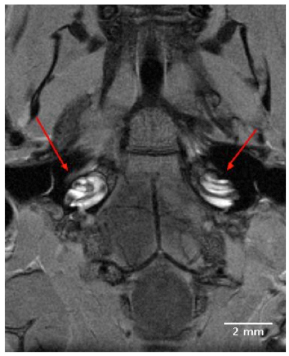 Magnetic resonance imaging (MRI) has been used to differentiate perilymphatic and endolymphatic spaces in clinical studies of patients with endolymphatic hydrops . In experimental MRI studies, the gadodiamide chelate (bound paramagnetic gadolinium ion) (Gd) has been shown to facilitate MRI visualization of the mammalian vestibulo-cochlea apparatus, including the scala tympani (ST), scala vestibuli (SV), utricle, (U), saccule (S), and semicircular canals (SCC), as well as the spiral ganglion and auditory nerve [2,3]. In vivo human clinical MRI studies, visualization of the perilymphatic and endolymphatic spaces has been achieved following intratympanic introduction of Gd . Both 2D and 3D high field, 4.7 Tesla experimental MRI observations of the anatomical and physiological dynamics of the mammalian inner ear in vivo during the uptake of the Gd contrast agent have been made in earlier studies on guinea pigs [3-5]. These seminal experimental MRI in vivo investigations of the guinea pig inner ear established that when injected intravenously or by intratympanic introduction through the round window, the Gd complex readily penetrates the perilymphatic space, but not the endolymphatic space of entire vestibulo-cochlea membranous labyrinth [3, 4-6]. It is possible, however, that passage of Gd (574 Da) across the blood-labyrinth barrier of the scala media occurs at some level, but is undetectable at lower MRI field strengths, including 4.7 T.
In the present experimental MRI pilot study, we used a higher field strength of 9.4T to determine whether the Gd complex penetrates any aspect of the endolymphatic space in vivo in the mammalian inner ear. While most in vivo high-field experimental MRI investigations of the mammalian inner ear have been conducted on the traditional guinea pig model [3-7], this study examined Gd uptake in the perilymphatic and endolymphatic spaces of the normal mouse inner ear. The mouse model offers favorable opportunities for neuro-anotomical and physiological studies of inner ear anatomy, and physiological kinetics of the dynamic transport of paramagnetic substances in the normal and pathological conditions . Further, the mouse model permits high field MRI investigation of a spectrum of genetic disorders of the inner ear, such as those seen in Pax2 mutants that exhibit morphological abberations of the cochlea and heterozygous Chd7 mice with semicircular canal dysgenesis [9-11]. All animal experiments were approved by the Ethical Committee for Animal Research in Stockholm, Sweden. Eight normal mice (wild-type C57 BL-6) weighing 22-25 grams were used in this experimental MRI investigation. The animals were anesthetized with 1-2% Isoflurane in 3:3 mixture of oxygen and air. The gadolinium contrast agent (Omniscan) gadodiamid 287mg mg/ml (0.5mmol/ml) [574 Da] was administered intravenously (IV) using the tail vein in a single dose of 1.5 mmol/kg. For image acquisition, the animals were placed in a Millepede coil (Varian Inc.) with an inner diameter of 30 mm, and situated in the isocenter of a horizontal 9.4 T Varian magnet equipped with a 12 cm inner diameter gradient system with maximum gradient strength of 600 mT/m. 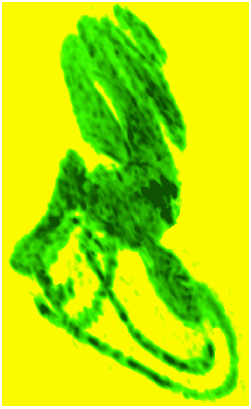 T1- weighted 2D images were acquired using a Fast Spin Echo sequence. Acquisition Parameters: TR: 500 ms; effective TE: 10 ms; echo train length (ETL): 4; echo spacing: 92.4 ms; number of averages: 32; data matrix: 256 x 256; field of view (FOV): 19.9 x 20 mm2, resolution (0.078x0.078 mm2). T1-weighted 3D images were acquired with a Gradient Echo 3D sequence. TR: 18.12 ms; TE: 3.03 ms; number of averages: 4; data matrix: 256x128x128; FOV: 18.9x6.4x6.4 mm3; resolution: 0.074 x 0.05 x 0.05 mm3. Image J version 1.43u. National Institutes of Health, 2003, and OsiriX software version 4.1.2 32-bit, a Macintosh-based medical imaging software, as well as Adobe Photoshop CS5 were used for the image processing. High resolution 2D images of the mouse scala tympani and scala vestibuli were visualized within 90 minutes following IV injection Gd. The Gd contrast agent enhanced visualization of the perilymphatic labyrinth, and permitted observations of all turns of the cochlea from base to apex. The 2D transverse orienting slice of Fig. (1) shows the bilateral anatomical organization of the normal mouse auditory structures, including both external auditory meati, middle ear chambers and left and right cochleae located in close proximity to the ipsilateral and contralateral brainstem. The dark boundaries in the coiled cochleae of Fig. (1), between the scala tympani and scala vestibuli indicated the absence of Gd uptake, and indicate that the sensory receptor compartment of the cochlea, the scala media, was impermeable to the Gd complex. A 9T, 2D transverse orienting slice showing the bilateral anatomical organization of the normal mouse external auditory meatus, middle ear and cochlea located in close proximity to the ipsilateral and contralateral brainstem. The scala tympani and scala vestibuli of the cochleae are clearly enhanced for visualization by the IV injected Gd complex, in contrast to the unenhanced dark rings of the scala media. The Gd contrast agent penetrated the entire perilymphatic space of the vestibular apparatus and the cochlea. The semicircular canals were fully enhanced by the Gd contrast agent within 6 hours after injection. Fig. 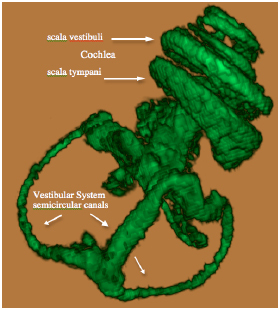 (2A) shows a 3D volume rendered image of the entire vestibulo-cochlea system of the mouse inner ear at 9.4T, including the coiled perilymphatic labyrinth of the cochlea (top), the superior, inferior and lateral semicircular canals, and the utricle and saccule. The 9.4 T images showed that the endolymphatic system was impermeable to the Gd contrast agent in all components of the vestibulo-cochlea system, and thus not image-enhanced at this higher field strength. The 3D volume rendered enhanced image in Fig. (2B) provides further evidence of the complete permeability of the entire perilymphatic labyrinth of the mouse inner ear to the Gd molecular complex. Fig. (3) shows the means and standard deviations of the temporal uptake if Gd in the normal mouse inner ear over a period of 130 minutes after intravenous injection. The first observation of contrast image enhancement begins at around 50 minutes post-intravenous injection, and continues to increase in intensity (arbitrary units) up to 130 minutes. 3D volume rendered (ImageJ softwear) MRI at 9.4 T of a normal mouse inner ear showing the saturation of the contrast agent Gd in the scala tympani and scala vestibuli of the cochlea and the vestibular apparatus following IV injection. 3D volume rendered MRI at 9.4 T of the normal mouse vestibulo-cochlea labyrinth revealing the superior, inferior and lateral semicircular canals, utricle, sacculus, and the scala tympani and scala vestibuli in each turn of the cochlea. 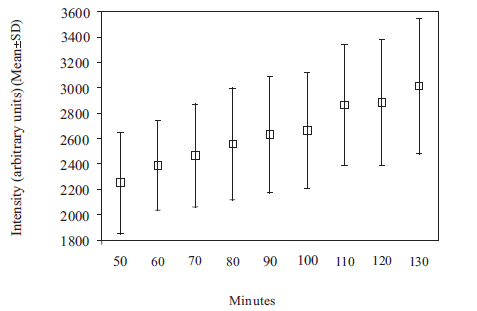 Plot of means and standard deviations of the uptake kinetics of Gd (intensity in arbitrary units) in the normal mouse inner ear as a function of time over a period of 50 to 130 minutes, measured at 9.4T. High field experimental MRI at 9.4T using the paramagnetic Gd ion as contrast agent permitted exceptional resolution of the in vivo mouse inner ear, including the cochlea and vestibular apparatus. Acquired images revealed Gd uptake in the entire perilymphatic space of scala tympani and scala vestibuli in all turns of the cochlea, and in the entire vestibular apparatus within hours after intravenous injection. Visualization of the contrast-enhanced scala tympani and scala vestibuli was acquired within 130 minutes post-intravenous Gd injection. The higher resolution images obtained at 9.4T established that the intravenously introduced Gd complex did not permeate the scala media and the blood-endolymph barrier of the receptor containing endolymphatic membranous space (nor blood-cortilymph tunnel space barrier), which is the site of auditory signal transduction. These findings confirmed the earlier experimental MRI observations at 4.7T of an impermeable blood-endolymph barrier of the scala media throughout the membranous inner ear labyrinth of mammals [1-3]. This study further illustrates the impenetrability of the tight junction blood-labyrinth barrier to Gd and possibly other complex molecules of similar size. The findings demonstrate the natural barrier protection for the receptors in the cochlea by the tight junctions of the spiral ligament capillaries and stria vascularis, as well as the receptors in the utricle and sacculus. These observations must be taken into consideration in attempts to deliver drugs to the endolympatic system to treat auditory and vestibular disorders. Besides molecular size and complex, a number of other factors affecting drug transport to the inner ear receptor sites, such as lipophilicity and the existence of active transport systems, could possibly also be tested by 9.4 T high resolution imaging of the mouse inner ear. To our knowledge, this is the first demonstration of the uptake of Gd in the perilymphatic labyrinth of the mammalian inner ear using a field strength of 9.4 T. The acquisition of advanced, high resolution Gd-enhanced MR images of the normal mouse vestibulo-cochlea system in the present study suggest that high field experimental MRI at 9.4 T is applicable to investigations of genetic deficits that affect the morphological development and physiology of the inner ear labyrinth in mutant mice. This would be particularly the case in knockout mice such as hox1, hox2, and PAX 2, which mimic human genetic disorders that induce morphologically distorted or aberrant inner ear structures and heating impairment. The higher resolution images of the 9.4 T experimental MRI system, using a Gd contrast agent, confirmed the findings of earlier studies of the mammalian inner ear at 4.7 T, which first showed that the endolymphatic membranous space that bathes the inner ear receptors and is the sight of signal transduction is protected by a tight blood-labyrinth barrier throughout the vestibulo-cochlea system, and is impermeable to the Gd complex. We thank Dr. Ernest J. Moore and Dr. Erik Borg for reviewing the manuscript and for helpful comments. LJ Connelly and MCB/Harvard Biological Laboratories are thanked for supportive assistance. This study was supported by a grant from AFA Insurance. Naganawa S, Yamazaki M, Kawai H, Bokura K, Sone M, Nakashima T. Imaging of endolymphatic and perilymphatic fluid after intravenous administration of single-dose gadodiamide Magn Reson Med Sci 2012; 11(2 ): 145-50. Counter SA, Bjelke B, Klason T, Chen Z, Borg E. Magnetic resonance imaging of the cochlea, spiral ganglia and eighth nerve of the guinea pig NeuroReport 1999; 10: 473-9. Counter SA, Bjelke B, Borg E, Klason T, Chen Z, Duan ML. Magnetic resonance imaging of the membranous labyrinth during in vivo gadolinium (Gd-DTPA-BMA) uptake in the normal and lesioned cochlea NeuroReport 2000; 11: 3979-83. Counter SA, Zou J, Bjelke B, Klason T. 3D MRI of the in vivo vestibulo-cochlea labyrinth during Gd-DTPA-BMA uptake NeuroReport 2003; 14: 1707-2. Zou J, Pyykkö I, Counter SA, et al. In vivo observation of dynamic perilymph formation using 4.T MRI with Gadolinium as a Tracer Acta Oto-Laryngol 2003; 123: 21-30. Duan M, Bjelke B, Fridberger A, et al. imaging of the guinea pig cochlea following round window gadolinium application Neuroreport 2004; 15: 1927-30. King EB, Salt AN, Eastwood HT, O'Leary SJ. Direct entry of gadolinium into the vestibule following intratympanic applications in Guinea pigs and the influence of cochlear implantation J Assoc Res Otolaryngol 2011; 12(6 ): 741-51. Zou J, Zhang W, Poe D, Zhang Y, Ramadan UA, Pyykkö I. Differential passage of gadolinium through the mouse inner ear barriers evaluated with 4.7T MRI Heart Res 2010; 259: 36-43. Burton Q, Cole LK, Mulheisen M, Chang W, Wu DK. The role of Pax2 in mouse inner ear development Dev Biol 2004; 272: 161-75. Adams ME, Hurd EA, Beyer LA, Swiderski DL, Raphael Y, Martin DM. Defects in vestibular sensory epithelia and innervation in mice with loss of Chd7 function implications for human CHARGE syndrome J Comp Neurol 2007; 504: 519-32. Hurd EA, Adams ME, Layman WS, et al. Mature middle and inner ears express Chd7 and exhibit distinctive pathologies in a mouse model of CHARGE syndrome Heart Res 2011; 282: 84-95.